Hi peeps, what’s up? So, seems the time for the big news is here. Well, 13th August is almost here and it’s time for me to go on a shopping spree. Wondering what I am talking about? Well, you must know this by now. It’s the 11th year already. You don’t know what I’m talking about? What are you doing man? 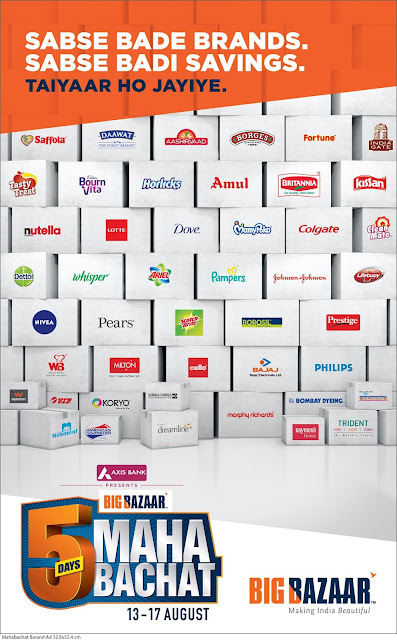 It’s time for “Mahabachat” – The Independence Day sale of Big Bazaar that takes place from 13th August to 17th August. Already in its 11th year, Mahabachat is one of the most anticipated sales in the mind of the Indian consumer. Business leaders from the biggest brands which would be a part of Mahabachat are coming out and saying “Hum Tayyaar hai”. They provide amazing discounts on some of the biggest brands like Nivea, Kelloggs, Unicharm, Milton, Prestige, Delmonte, etc.